Pope Vigilius (d. June 7, 555) reigned as pope from 537-555. He came to the papacy in a controversial manner when the Empress Theodora, the wife of Emperor Justinian I exiled Pope Silverius and installed Vigilius in his place in the expectation that he would reconcile the western church with the Monophysites. After Silverius' death, Vigilius' pontificate was legitimatized by the Roman clergy. Vigilius then betrayed the empress' expectations and held firm to the position of the Council of Chalcedon. He then became embroiled directly with the emperor himself in the the Three Chapters controversy, designed to ease tensions with the Monophysites of Syria and Egypt. The Three Chapters consisted of propositions regarding: the person and writings of the Nestorian bishop Theodore of Mopsuestia, certain writings of Theodoret of Cyrus, and the letter of Ibas to Maris in Persia. However, by failing to condemn Monophysite heresies at the same time, the condemnation of the Three Chapters was viewed, especially in the west, as contrary to Chalcedonian orthodoxy. 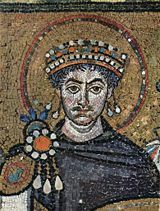 Emperor Justinian forced Vigilius to come to Constantinople, where he eventually consented to their condemnation by the Second Council of Constantinople, provided that the canons of the Council of Chalcedon would not be thereby discredited. His action was intensely disliked in the west. He remained a virtual prisoner at Constantinople for eight years. He died on his way back to Rome, and was succeeded by Pelagius I.
Vigilius belonged to a distinguished Roman family; his father Johannes is identified as a consul in the Liber pontificalis, having received that title from the emperor. Reparatus, a brother of Vigilius, was a senator. Vigilius entered the service of the Roman Church and was ordained a deacon in 531, in which year the Roman clergy agreed to a decree empowering the pope to determine the succession to the Papal See without consultation with the Roman senate. Vigilius was chosen by Pope Boniface II as his successor and was presented to the clergy assembled in St. Peter's Basilica. Opposition to such a procedure led Boniface in the following year to withdraw his designation of a successor and to burn the decree respecting it. The second successor of Boniface, Pope Agapetus I (535-536), appointed Vigilius papal representative at Constantinople. Vigilius thus came to the eastern capital. 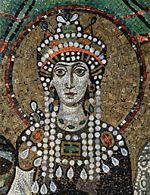 Empress Theodora, wife of Justinian I sought to win him as a confederate, to avenge the deposition of the Monophysite Patriarch Anthimus I of Constantinople by Pope Agapetus, and also to gain aid for her efforts in behalf of the Monophysites. Vigilius is said to have agreed to the plans of the empress, who promised him the Papal See and a large sum of money (700 pounds of gold). After Agapetus's death on April 22, 536, Vigilius returned to Rome equipped with letters from the imperial court and with money. Meanwhile, Silverius had been made pope through the influence of the King of the Goths, who were now in control of much of the west. Silverius acted against Theodora's interest by continuing Rome's policy of refusing to recognize Patriarch Anthimus. Soon after, the Byzantine commander Belisarius garrisoned the city of Rome, which was, however, besieged again by the Goths. Vigilius gave Belisarius his letters from the court of Constantinople, which recommended Vigilius himself for the Papal See. False accusations that Silverius was in league with the Goths now led Belisarius to depose Silverius. Owing to the pressure exerted by the Byzantine commander, Vigilius was elected pope in place of Silverius and was consecrated and enthroned on March 29, 537. Silverius, meanwhile was reduced to the rank of monk exiled to Anatolia. There, he appealed to Justinian I the Great who sent Silverius back to Rome and launched an official inquiry. Vigilius, however, succeeded in having Silverius banished to the island of Palmaria. There, Silverius soon died from the harsh treatment he received. 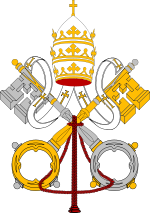 After the death of his predecessor, Vigilius was recognized as pope by all the Roman clergy. This apparent victory for Empress Theodora, however, was illusory as Pope Vigilius eventually maintained the same position as his predecessor against the Monophysites and the deposed Anthimus. In 540 Vigilius took a stand in regard to Monophysitism in two letters sent to Constantinople. One of the letters was addressed to Emperor Justinian; the other to the Patriarch Menas. In both letters, the pope supported positively the synods of Ephesus and Chalcedon, the decisions of previous popes against Monophysitism, and especially the deposition of the Patriarch Anthimus. Earlier, on March 6, 538, he wrote to Bishop Caesarius of Arles concerning the penance of the Austrasian King Theodobert on account of his marriage with his brother's widow. On June 29, 538, a decretal was sent to Bishop Profuturus of Braga containing decisions on various questions of church discipline. Bishop Auxanius and his successor, Aurelian of Arles, entered into communication with the pope respecting the granting of the pallium (woolen cloak worn by popes) as a mark of the dignity and powers of a papal legate for Gaul. In the meantime, new dogmatic difficulties had been developing at Constantinople that were to give the pope many hours of bitterness. In 543, Theodore Askidas, Bishop of Caesarea in Cappadocia, called Justinian's attention to the fact that the condemnation of various representatives of the Antiochene school, who had championed Nestorianism, would make reconciliation with the Monophysites of Syria and Egypt much easier. The emperor, who laid much stress upon winning over the Monophysites, agreed to this, and in 543 or 544 he issued a new edict condemning the Nestorian "Three Chapters". The Oriental patriarchs and bishops signed the condemnation. In Western Europe, however, the procedure was considered unjustifiable and dangerous, because it was feared that it would detract from the importance of the Council of Chalcedon, which had—in the eyes of the papacy—already adequately condemned Nestorianism and had also clarified the errors of Monosphysitism. Vigilius refused to acknowledge the imperial edict and was called to Constantinople by Justinian in order to settle the matter there with a synod. The pope was taken immediately to a ship that waited in the Tiber, in order to be carried to the eastern capital, while a part of the populace cursed the pope and threw stones at the ship. If the story related by the Liber pontificalis is essentially correct, the pope probably left Rome on November 22, 545. He remained for a long time in Sicily, and reached Constantinople about the end of 546 or in January, 547. Rome was now besieged by the Goths under Totila. Vigilius sought to persuade the emperor to send aid to the inhabitants of Rome and Italy. Justinian's chief interest, however, was in the matter of the Three Chapters. Under extreme pressure, Vigilius reportedly wavered frequently on the issue. Vigilius finally acceded to the emperor's wishes when he acknowledged in a letter of December 8, 553, to the Patriarch Eutychius the decisions of the Second Council of Constantinople and declared his judgment against the Three Chapters in a Constitution of February 26, 554. Thus, at the end of a sorrowful residence of eight years at Constantinople, the pope was able, after coming to an understanding with the emperor, to start his return to Rome in the spring of 555. While on the journey he died at Syracuse. His body was brought to Rome and buried in the Basilica of Sylvester over the Catacomb of Priscilla on the Via Salaria. Much of Vigilius' legacy is based on what proceeded from the Second Council at Constantinople called by the Emperor Justinian. His papacy was marred by several flaws: his early cooperation with Theodora and later betrayal of her intent when he returned to Rome, his mistreatment of his predecessor Pope St. Silverius, and his vacillation and ultimate capitulation to Justinian during the Three Chapters controversy. This page was last modified on 21 January 2016, at 14:59.